One of our favorite things about living in a ski-town is the limitless amount of activities and the amount of willing participants. Normally, we would be talking about what there is to do in the winter, but the same holds true during summer. On any given day the schedule could be to go mountain biking, follow it up with a swim and finish off the day with a bbq. Or it could mean a little corn skiing in the morning, then going climbing in the afternoon. All are a great way to get out with your friends & family and enjoy your surroundings. Whether chasing the adrenaline rush or just out to explore and get some exercise the options are endless. So, for me it’s Saturday night. My current schedule only allows me to be a weekend warrior for now. Having two days off, I try to pack in as much fun and adventure as I can. I’m always game. So at 9:29 p.m. I get a text. Some friends were heading to Sand Harbor in the morning and wanted me to come along to check out what they were doing. It was not something new to the world, but new to them. Really, it’s a combination of two disciplines. I guess one you could call a sport and the other a mind & body exercise. Having done both I was excited to see them done together. To me, it seemed impossible. 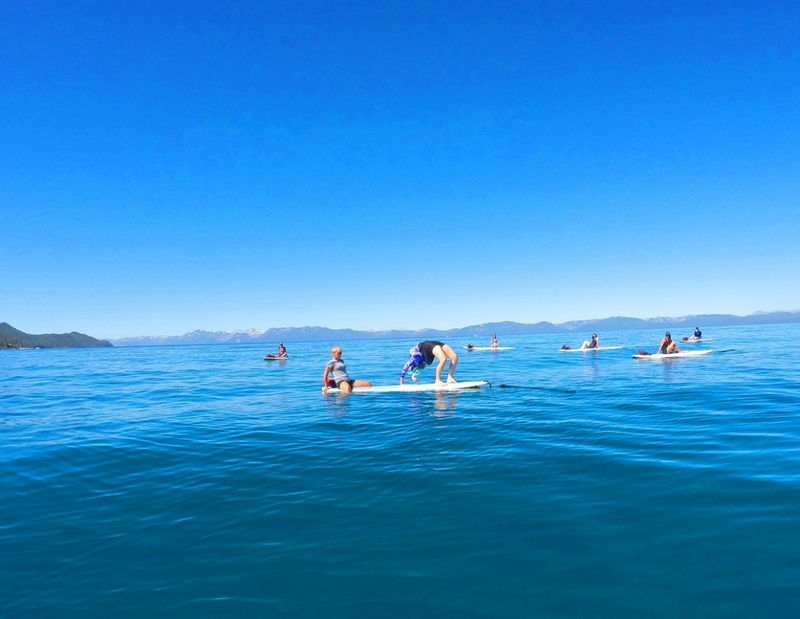 The activity…Stand up paddleboard Yoga or SUP Yoga for short! SUP isn’t new and we all know, neither is Yoga. SUP began on the beaches of Hawaii in the 60s. About 10 years ago it burst onto the scene on the mainland. One of the reasons the sport took off is because with a little skill and coordination, most are able to get going their first time out and it’s a great overall body workout. Balancing on the board is a great core and leg workout while paddling engages the arms and back. On the other hand, Yoga has been around for quite some time. Although an exact date of its origin is unknown, archaeological evidence of its existence found in the East can be traced back to 3,000 B.C. Yoga made its way to the West in the early 19th century. Although there are many forms the most popular principals are relaxation, exercise, breathing, diet and positive thinking. A short time after hitting the mainland SUP progressed. The idea of combining the two activities was born. The board is broad and stable enough and there was plenty of room to add the mat. The first thing that comes to mind is this will be seriously challenging. I see pictures around the lake of people doing it all the time, but I needed to experience it firsthand. I pulled into Sand Harbor parking lot around 8:20 a.m. Over towards the boat ramp I saw a gathering of ladies and SUPs laying on the ground. As I made my way over I noticed the Yoga Sol trailer. It had a catchy logo and come to find out the name roots back to the owners Hispanic/ Mexican culture. It was the perfect group for me to take in my first SUP Yoga experience. 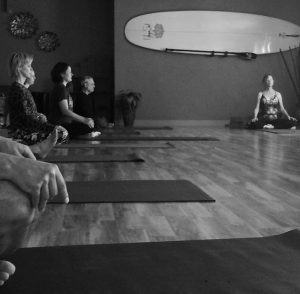 Owner and Instructor Jennifer Andrews has been practicing Yoga for 20 years. About 5 years ago her friend in LA, Mike from SUP ATX, convinced her to get into this new craze. He’s been around the industry for quite a while. Originally part of the Becker Surfboard crew, she says he saw this coming. Down to the beach to watch as the group gets ready. It wasn’t what I expected. Right in the beginning a major emphasis was put on safety. You knew this just wasn’t your average day on the lake. Jenn says her training in Sausalito was intense. Instructors have to endure a couple days learning and participating in Yoga, first-aid, safety, rescue and CPR. Although people show up and are ready to go for each class, ultimately the water conditions determine whether it can be held. After a few more recommendations regarding safety Jenn explained the equipment. Yoga Sol uses custom made Yoga specific SUPs which are more stable and have a mat on the deck. The general positioning to get into the poses starts in the center by the handhold and then is adjusted based on the conditions. She says it’s really important to have symmetry. Lastly, beginners tend to have a death grip with their toes, so it key to remember to relax your feet. The last bit of information is regarding what the experience will be like. 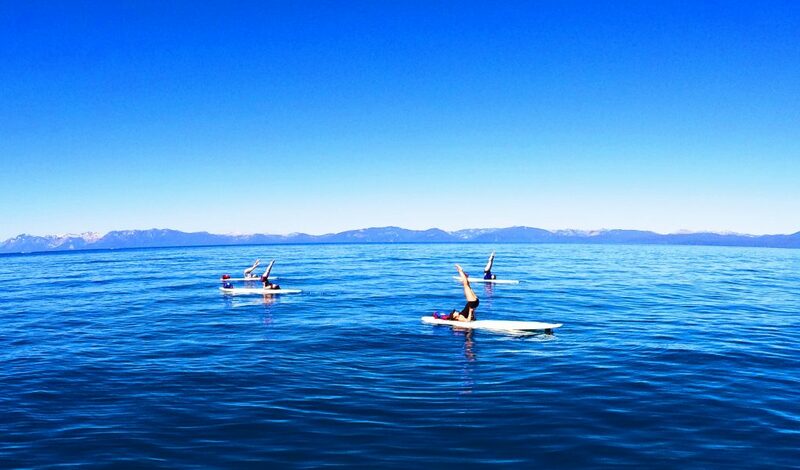 SUP Yoga is all about fun. 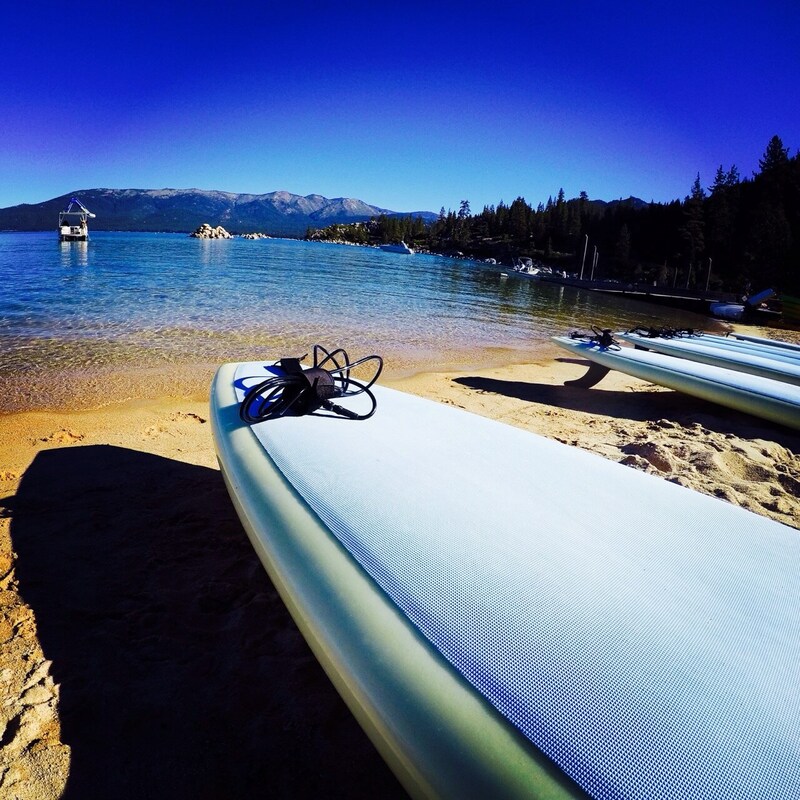 It’s for any and all levels of paddle boarders and Yoga practitioners. Really the only main requirement it that you are able to swim. Jenn explains that it’s a combination of technique and fun! It’s really important not to take yourself too serious. The last ingredients are to bring your sense of adventure and be prepared to work & play. Once finished with the final instructions, the class began to help each other get the boards on the water. When all were ready, one by one each hopped up to put the instructions to the test. Many popped up right away, while others took a minute to gather their sea legs. In no time everyone was up and heading around the point. The 10 minute paddle out was a great way to warm up and to get a feel for the water. When the whole class reached the destination, it was time for part two. While there is some carryover from dry land, Yoga on the water is a different beast. Technique is important, but it’s essential to find your balance within the two disciplines. Being out there and watching, it was very impressive to see the skill and determination of the class. The poses increased in difficulty and the fun increased as well. Living in the moment and giving their all, the class pushed the boundaries of what they thought possible. As the limits were expanded and everyone was digging deep, suddenly there was a big splash! Trying to go for it, one in the class took it over the edge and ended up in the drink! Quickly, she was up and out of the water and back up into a pose. There were smiles all around and no judgment. A few joked as they continued to practice and encourage each other. Then…splash! Another had pushed past the brink. It was interesting to see that after a few fell, everyone else tried to extend further instead of pulling back. It was as if a sense of ease came over them. After an hour more, you could tell that in this short period of time the group had become familiar and were really enjoying the morning. Jenn was able to provide instruction so beginners and experienced participants were equally challenged. Towards the end of the class she provided two options. One less challenging and the other seemed impossible to me. I’m sure you can guess, but these ladies chose to go for it. The critical tips regarding technique were given and then the demonstration. Jenn positioned herself strategically on the board she shared with another. Like it was nothing she popped right up into a full backbend! It was cool to see the strength and skill she was able to display in the pose. To my surprise and not to be outdone, one by one each in the class gave it a shot. I watched in amazement as most were able to pull off this challenging move. All cheered as the others pushed their selves. By now all were having a great time, smiling and laughing and you could tell they felt a sense of accomplishment. After a few last words Jenn wrapped up the session and the ladies headed back in. On the way back the entire class joked about their shortcomings and acknowledge their enjoyment. As they paddled back into the beach it was written on their face. You will park across the street in the open parking lot and walk over to the Ski Beach shoreline to meet the class. Parking is free. 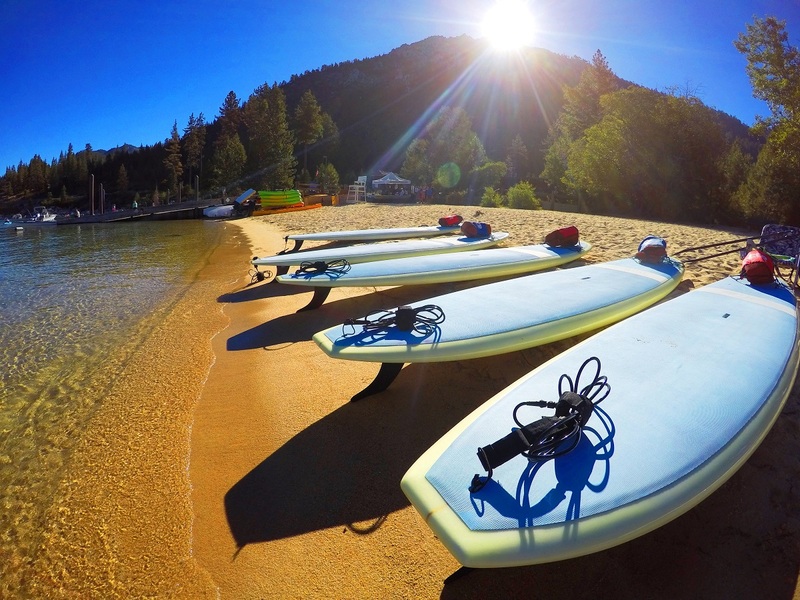 Call 775- 832-1300 to sign up for paddleboard yoga classes at Ski Beach, Incline Village. Fee: $40 for IVGID members, $50 for non-IVGID members. Fee: $40 (parking fee at Sand Harbor is additional)You will have to park in the main lot and walk over to the boat ramp to meet the class. The main parking lot gate ($10 parking fee) opens at 8 am, and class starts at 8:30 am. For traditional Yoga classes go HERE for their schedule. Thanks for covering this event Local Freshies! I was so apprehensive to attend, but am so glad I did. It was fun and challenging at times, but exactly what I needed to kick my Sunday Fun Day off. I would highly encourage anyone at any skill level, in either yoga or SUP, to try this! It will definitely bring a smile to your face. Hey Aubrie! Thanks for allowing Local Freshies to tag along during the class. It was great to see the progression of the class in such a short time. Everyone went at their own pace, but by the end the entire group was pushing their personal limits which was awesome to see! And yes, 100% guaranteed to make you smile! haha… I was in that class! 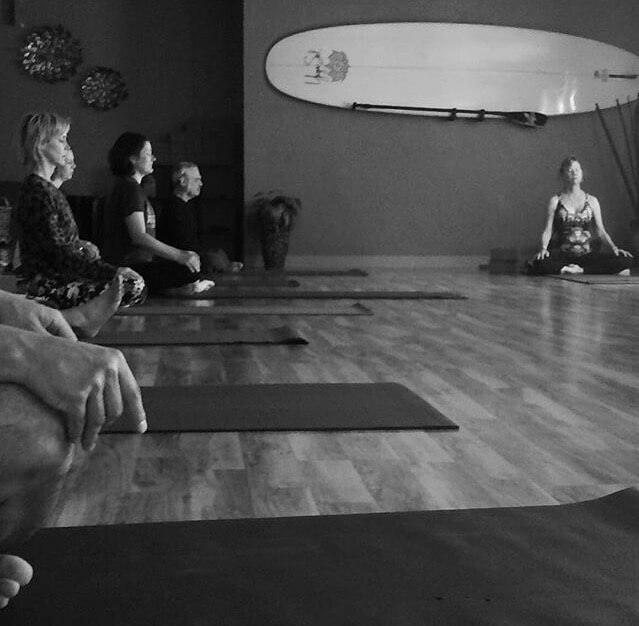 It was challenging, but loads of fun because there was no pressure to be perfect with yoga or on the board. I found that once I fell in, I relaxed and could move more easily without fear of what it would be like to fall off the board and into the water. SO much fun.. I highly recommend it for beginners-advanced of either sport. It was great to be out on the lake! I loved this class and I will definitely do it again. Judy you all did great and it was a blast to watch. I think you nailed it in your description above…after covering the class I might even give it a shot! Jennifer and Yoga Sol – Carson City really do a great job! Maybe I’ll run into you on the water. Thanks for the comment! Hello Melissa! I’ve spoke with Jenn and she said to give you her number. Sending it over via email now. If you are still having trouble get back in touch with me and we will figure it out.